There must be hardly anyone out there who doesn't know about downloading videos, most of us who have a computer are quite familiar with the use of different ways of grabbing videos from the web and the different online video sharing sites on the internet. However, the methods usually wary from one site to the other, for example, in the case of online video streaming sites such as the YouTube and Vimeo etc., all that you need would most likely be a good extension for your browser and you are good to go. Today, we will take a look at the available and best options for video download from the online websites and consider which one of them is better than the others. iTube Studio is one of the best video handling software available in the market today and does much more than just download your favorite online videos from the internet. 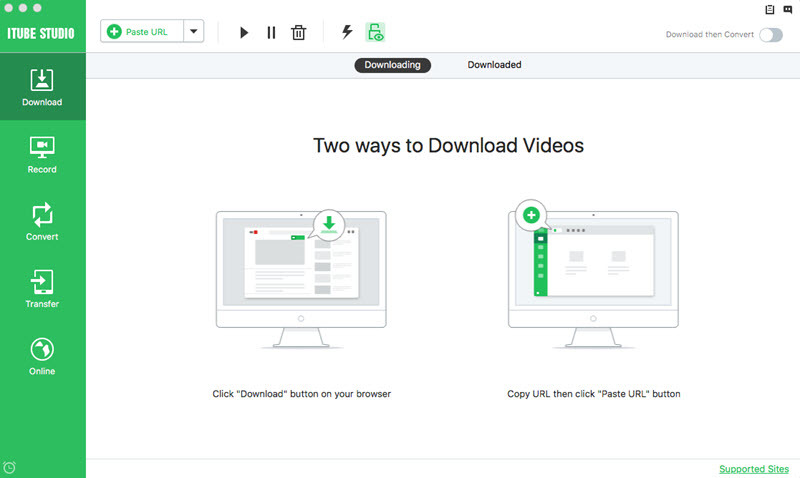 It not only lets you download videos easily and quickly, but also convert them as needed, not just from the sites such as the YouTube, AOL and Dailymotion, but over 10000+ video sharing sites in total. • Works with many popular video sharing sites on the internet - iTube Studio is not only a super fast and easy to use video downloader, but it is also an excellent video converter. So, the videos you download from the 10000+ video sharing sites that iTube Studio easily supports, can be converted to be viewed on your favorite mobile devices as well. • Download as you like - iTube Studio offers a choice of 3 different ways to download your favorite videos, and comes with the easiest of them all user interface; 1) download videos with the help of the Download button, 2) copy and paste the video URL for download, or 3) simply play the video you want and record it, using the inbuilt video recorder. • Rapid fast download, almost 3X - With its exclusive multithreading technology, video downloads are blazing fast on iTube Studio. You also have the option of scheduling your downloads in multiple ways; Auto Shutdown, Exit Program, and Enter Sleep Mode. • Video Converter like no other - iTube Studio is a great downloader and an equally good video converter as well. It can help you convert your videos into multiple formats, 150 or more in fact, and it does that in just a few clicks. Now, you can easily convert those videos that you like and view them on many devices of your choice, for example, the iOS devices and other smartphones. Last but not the least, iTube Studio also extracts the original audio from online videos, in case you need that. • Download HD videos - It can download HD video including 3d/4K for high end devices. 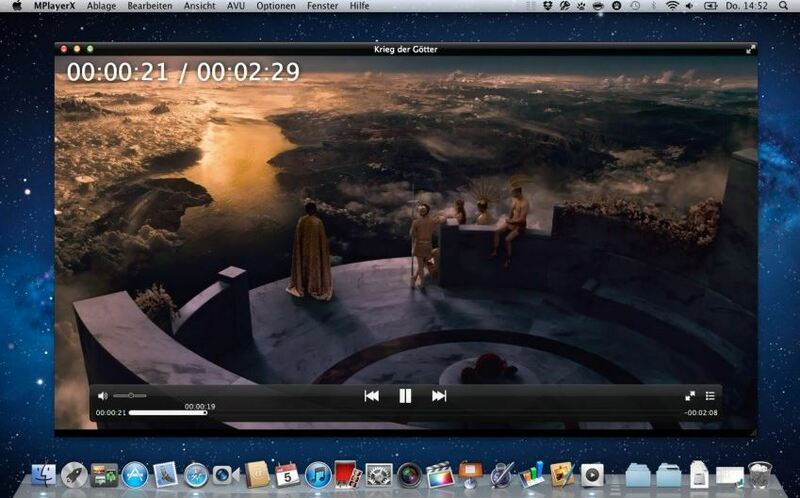 • Built-in video player - After downloading you can directly play video with the Built-in video player. Step 1 Download and install iTube Studio on your computer by clicking here. Once installed, go ahead and launch the application. Step 2 Now, open any of your browsers, find the video you would like to download, and play it. You can also use the inbuilt browser that iTube Studio comes with, in the section 'Online'. If you use the iTube Studio's inbuilt browser, you can directly download the videos by pressing the button 'Download', given on the top right hand side of the screen. Step 3 Or, you can also copy the link of the video and paste it using the button '+ Paste URL'. 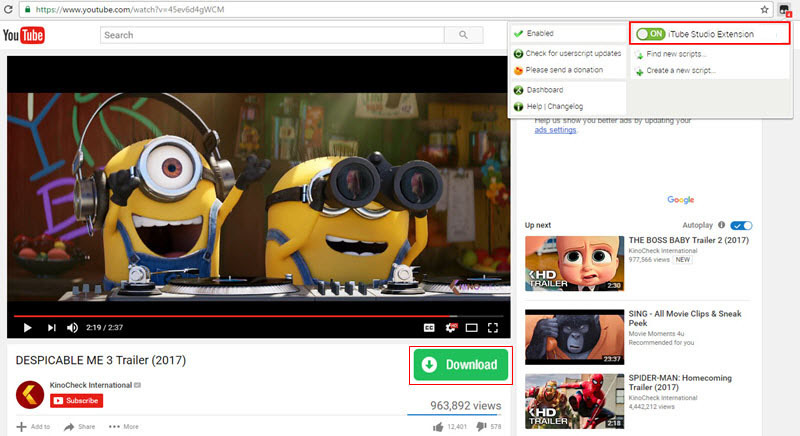 When it comes to browser extensions for video download, there are only a few that are really good. One of such extensions is iTube Extension, it support chrome, firefox, saferi and other popular browser. After you have installed it, you can download video with the download button easily and freely. Here will tell you the steps to install the super Extension. 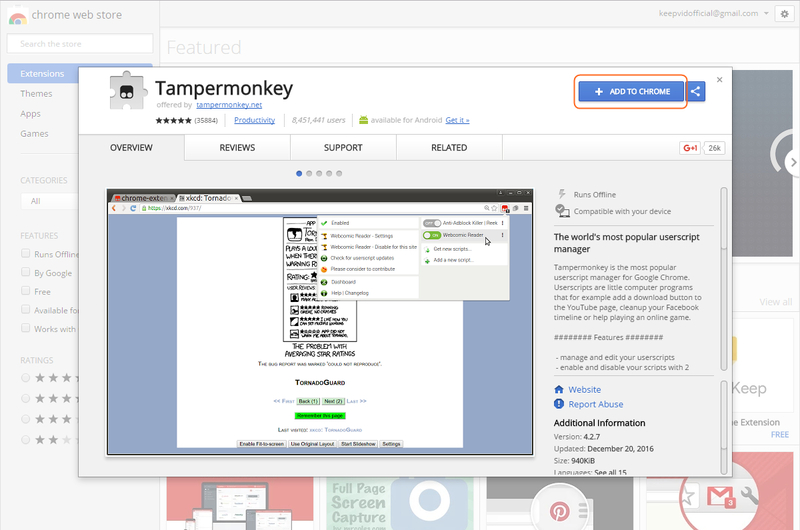 Step 1 Firstly, add the GreaseMonkey (only for firefox browser) / TamperMonkey (for other browsers) add-on to your browser if you don't have it already. You need install the right add-on for your browser. Step 2 Once you have added the add-on to your browser, then click here to install iTube Extension. The extension support 28 popular websites. 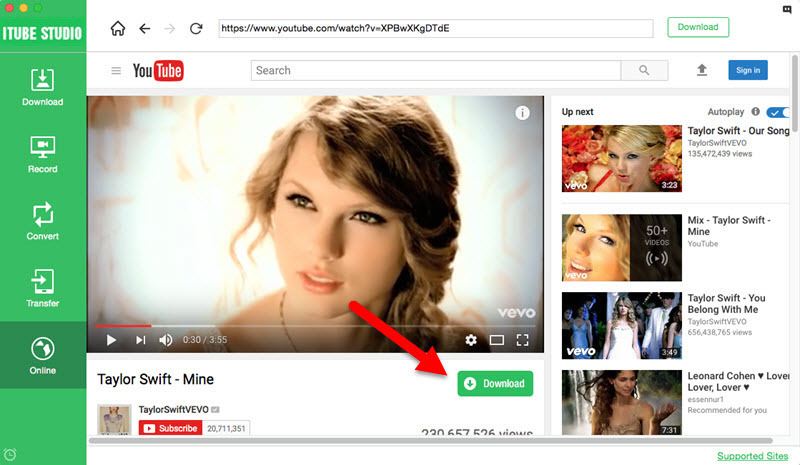 Step 3 Refresh your browser, visit a video sharing website and find a video, play it, you will find a iTube download button under the video.Now klick the button to download the video you want. savefrom.net is an online website that allows you to grab any online video by simply copying and pasting the link. It supports the download of HD videos and is totally free to use. 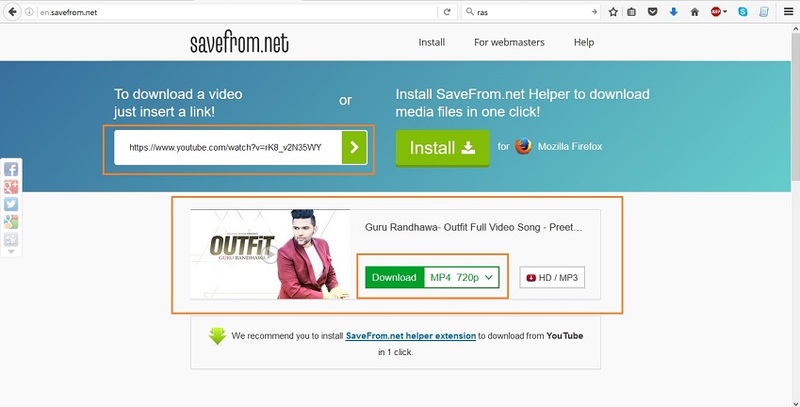 Let us take a look at how to use Savefrom.net to download the videos now. Step 1 Go to online website: savefrom.net. Step 2 Now, in another browser tab, open the video site that has the online video that you want to grab and copy the link of the video. Go to the savefrom.net and paste the video link, click then DOWNLOAD button, as shown in the image. One of the best screen capture software in the market today is TinyTake. 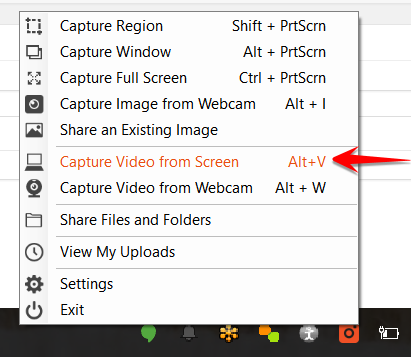 It is free and available for both, Windows and Mac users, and allows you to capture images and videos of your computer screen. It also lets you add comments as you please on the captured video, before sharing them. The steps to use this software are as given below. Step 1 Click here to download and install the software on your computer. 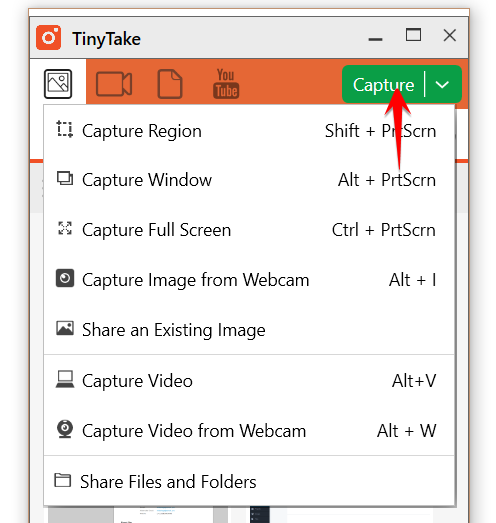 Once installed launch the application, you can click the icon for TinyTake within the system tray and then select 'Capture Video from Screen' option. Step 2 Now, click on the Capture button, given on the right hand side of the app interface, you should get a drop down with options to capture the screen in different settings, select the one you prefer and that's it, the app will begin recording the video and do the rest.